1000QE is a superb single-phase hot water electric pressure washer. This unit uses diesel fuel to heat up the water necessary to work with heat reactive substances (food, oil, grease etc.). The burner has an 8-gallon rust free poly burner fuel tank. This allows a smooth and uninterrupted long hour operation. 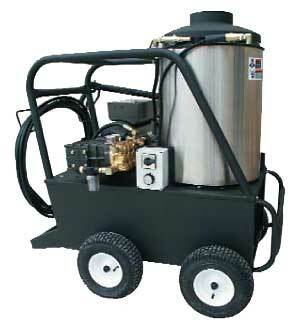 This hot water electric pressure washer is the lightest model in its category. It is excellent for applications where large amounts of hot water are necessary to complete the job. It comes with thermal relief valve that protects the pump from overheating. Some other features include triplex plunger pump with ceramic plungers and stainless steel valves, 35’ power cord with ground fault interrupter, trigger gun, adjustable pressure, 13” pneumatic tires with tube and chemical injection.